Université d’Abobo-Adjamé (UAA) ; Centre Suisse de Recherches Scientifiques (CSRS) ; Centre National de Recherche Scientifique (CNRA) ; Société Ivoirienne de Technologie Tropicale (I2T). world leading producer with a 110-million-tonne annual output, followed by Asia (55 million metric tonnes) and Latin America and the Caribbean (37 million metric tonnes). Yet, African countries use almost all the volume of cassava available at domestic level for people’s food, as food crop above all else. On the other hand, Latin American and Asian countries use cassava as animal feed and for other purposes, especially in food and non-food industry. As a result, Latin American and Asian cassava-based products have a stronger foothold on the global market than those from African countries. The question arises as to how this can be rectified. The 15 countries of West Africa have become a regional union under the ECOWAS. On this basis, the eventual future is for cassava, like other commodities to spread and become tradable among these countries. Now, the discussion should be on creating demand for the use of cassava in food, livestock feed and in local industries. Information collection, collation, analysis, storage, retrieval and relevant wide dissemination are important steps in the management of market operations. Few government agencies can engage in this effectively in a real-time way. Gaps in spatial information on all marketing operations reduce market efficiency, organisation and development. Regularity and accuracy of the prices, quantities and the description of the quality of items for sale are often not available. Price information is an average with no measure of its dispersion or variance when broadcast or televised or put in newspapers. Progress in this line will help all participants in the cassava economy to plan and estimate profits and make decision on how to do business. This is the most variable aspect in the determination of processed products. This arises from the many techniques and machines used in the many steps of processing. These combinations create a lot of options in the processing pathways. The differential efficiencies and effectiveness make it difficult to monitor costs of processing fresh roots into the five major cassava products: chips, gari, high quality unfermented cassava flour, fermented lafun, and starch. Besides the cost of roots, the processing and packaging are core cost lines. 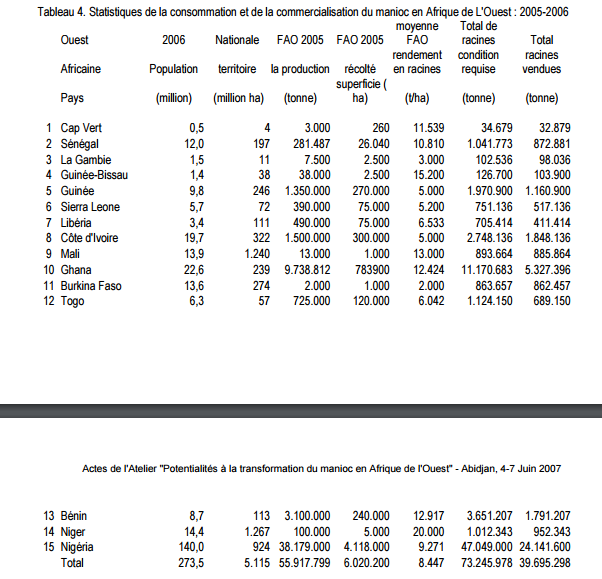 Overall, the 15 countries of West Africa would have a combined total cassava root demand of 73.2 million tonnes of fresh roots in 2007/2008 but 39.7 million would be sold in markets (Table 4). The new farmland to grow the extra needed cassava would add up to 8.3 million hectares. The total hectares required to grow cassava to meet the estimated quantities add up to 8,332,014 ha which implies a new additional cultivation of 2,311,814 ha. Mechanisation of production is important in this regard if lower prices are to prevail on account of better yields from the higher levels of input and more effective organisation of the cassava systems for all operations. Production Efforts to improve the cassava economy of CI hinges on. Increasing the cultivated area under cassava crop using best-bet practices. In Africa which produces about half of world cassava, Cote d’Ivoire is the fifth with an annual cultivated area of 320 000 ha that gave an output of 1,688,000 tonnes with and average yield of fresh roots at 5275 kg/ha in 2001. Commercialisation World trade in cassava products is limited to a few dry products. These are starch, dry cassava in form of pellets, crumbs, chips, flour and their modified forms [chemical or physical]. There are also many derivatives and bye-products that bear no physical resemblance to cassava such as adhesives, sugars, and ethanol. However, only a small number of countries dominate the export and because more of the national output is low per person and little extra remains after food uses and losses are discounted from the output of cassava. Root and tuber (R&T) crops occupy an important strategic place in Ghanaian agriculture as smallholders grow them both as household food security and cash crop. R&T crops contribute about 40% to agricultural GDP and 25% of overall GDP. The key issues relate to how to: (i) give the rural poor access to improved cassava (mainly gari) processing technology in cassava surplus districts, (ii) provide skills training (marketing, processing; management, quality, hygiene, environmental issues, etc. ); and iii) demonstrate best practices. New forms of R&T for human consumption. Exports of processed R&T to Europe are growing steadily, but growth potential is limited. Meanwhile, a small market for R&T quality products (instant flour, etc.) and distributed via local supermarkets exists in Ghana. Quality requirements in both markets are comparable (improved packaging, brands, hygiene, etc.). Per unit profit margins of these high-value added products in the export markets are high, which results in retail prices that are too high for the local market. In Guinea, cassava is an important crop, with a national production estimated at 1,350,000 tonnes from 270,000 ha and a mean root yield of 5.0 t/ha (FAO 2005). This is equivalent to 11% of the total cultivated area and accounts for 16% of the food energy consumed by Guinean people. Local rice contributes 26% of food calories and occupies 49% of the cultivated area. Presently, cassava is a staple for people in dry zones of Guinea where the soil fertility is very low and farmers cannot apply inputs such as expensive and unavailable fertilisers. The major constraints to cassava production in Guinée are: 1) Low soil fertility; 2) use of genotypes susceptible to CMD, mealy bug, green mites infestation, and termite attack; 3) livestock damage; and 4) absence of improved varieties. Cassava for food dominates the current usage in Sierra Leone. A little percentage is however being used for livestock and other cottage industries. Roots come from small separate bush fallow farms planted with cassava under intercrops and thus give average cassava root yield of about 7 t/ha when planted at 1.2 x 1.2 m with 3-5 stakes and harvested 6-9 months after planting. Cassava makes up some 30-50 % of the sole crop stand density. The absorptive capacity of the market affects the response to production of cassava. 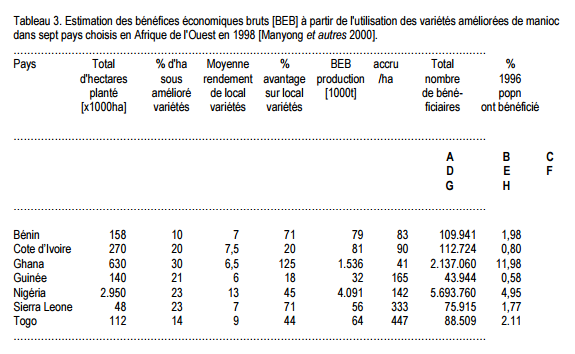 However, rice is 10 times the value of cassava sold (Roberts 1992). Export of cassava and its products from West Africa will be largely limited to demand areas within Africa for reasons of quantity, quality, type of product, tardiness of operations, high price, packaging, transportation difficulties, international and national policy conflicts, commodity networkchain unions, etc. Climate change will destabilise and reduce outputs of cereal and pulse crops thereby raising the demand for cassava. Cassava shoot, foliage and root wastes will increasingly be converted to feed for poultry, pigs, goat, sheep, fish, and other small ruminants. Cassava has long been recognized by IFAD as a strategic crop in Africa, particularly for the Western and Central Africa (WCA) region, due to its high potential to contribute to pro-poor rural and agricultural development. The first IFAD pro-cassava project in WCA dates back to 1980; IFAD’s cassava current project portfolio in the region is about USD 110 million, with ongoing projects in Ghana (since 1999), Nigeria (2001), Benin (2001) and Cameroon (2004). Further expansion of activities is planned. Over all of the 80s and the 90s, IFAD contributed to cassava development by initiating and enabling pilot projects (mainly production oriented) and studies. While the successes of these initiatives resulted mainly in an increased crop production and productivity, the major challenges today relate to post-harvest processing and market access. In the same way, while so far most efforts to develop the cassava sector have been devoted to national programmes, lessons from past and ongoing experiences underscore the importance of sub-regional, and even regional, interventions as markets and businesses stretch beyond national borders. Enhance policy dialogue, both at a national and regional level, to support cassava industry development efforts. 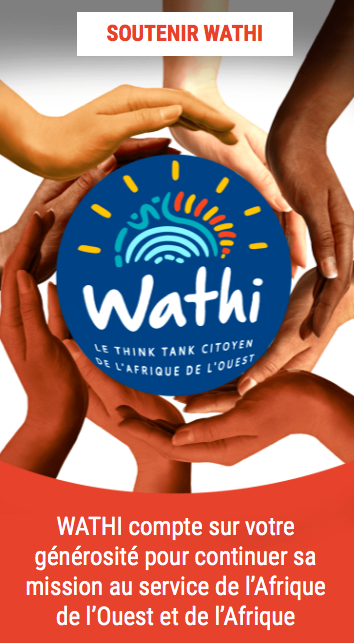 Promote policy dialogue with regional and national policy makers, building up new or consolidating existing partnerships with concerned regional organizations/institutions and national Authorities. A detailed plan of action for the RCPMI, covering the whole life span of this Initiative, is being worked out and will be completed soon after the main stakeholders within the IFAD cassava concerned projects and the overall cassava industry in WCA region, will be consulted. Participation to this Regional Workshop is a concrete effort the RCPMI has made towards this goal. Past and current research activities have been on the development of new processing techniques and machinery for making high quality, safe food and raw materials from cassava, testing and adapting the use of the technologies and the new cassava products in Africa with effective information on good manufacturing, agricultural practices, and hygienic practices. Over 1000 households are currently benefiting from the production of HQCF in West & Central Africa, Eastern and Southern Africa sub regions respectively. Significant capacity building was achieved with more than 20 students who completed their postgraduate degrees during the review period, in addition to several short-term attachments, as well as technical backstopping provided to national programs. Various options have been adapted to develop cassava in WCA. A situation where beneficiaries will obtain 100% inputs from donors, implementing agencies or government has been proven to be unsustainable interventions. Also, releasing fund to beneficiaries to procure any of the required processing facilities has been diverted for other use. Recently, allowing equity contribution from all relevant stakeholders (especially from individual beneficiary) in the development of cassava industry has proven to be highly successful, controllable and with high level of organizational skills. Most of the financial institutions in Nigeria have started to provide equity contributions to sustain the supply of quality cassava products. Efforts are also being made to improve the traditional cassava processing techniques, expand market opportunities for cassava, develop private sector interests to invest in the cassava sub sector, and promote policies that favor cassava development. The uses of HQCF are gaining wider application in Ghana and Cote d’Ivoire. It is already a success in Nigeria (for bread) with the 10% Government policy initiatives. Most importantly, the introduction of the policy of 10 per cent cassava flour inclusion in bread and other confectionery has made a “goldmine” out of cassava which now employs millions of Nigerians and provides income for farmers and processors in large numbers. The direct consequence of the introduction of the Policy of 10 per cent cassava flour inclusion in bread is an incremental annual demand of 300,000 T High Quality Cassava Flour by the Flour Milling Companies in Nigeria. This measure creates market for about 1.5 MT million cassava roots. Available records in the public domain indicate that processors could only meet 2 to 5 per cent of the demand for cassava flour due mainly to the constraint of inadequate processing facilities. Some companies in the region are using cassava for plywood glues, cassava adhesives and glucose syrup. Ekha Agro-a new company along Lagos-Ibadan road was commissioned in March 2007 to produce 26% of the annual National Glucose syrup demand from cassava. IITA is strengthening the formation and stabilization of the Cassava Growers Association, Cassava Processors Association and Cassava Equipment Fabricators Association to serve as good marketing platform for the private sector’s interest and driving force to sustain the cassava industry. There are substantial opportunities for breeding varieties perfectly suitable for specific processing industries. The technologies and machinery, particularly for drying, peeling, etc., are still not well known in many African countries. An effective cassava processing system in WCA requires a coalition of private-public partnerships, with the private sector investing in market development and procuring needed machinery. Currently, IFAD’s cassava processing and marketing regional initiative workshop, Accra declaration, March, 2006 also affirmed previous action plans with the private sector as the key driver. The public sector has to provide the needed policy environment, improve competitive technology, and particularly physical infrastructure. The market diversification will also require strengthening the presently weak link between industrial processors, fabricators, and the producers of cassava products in WCA. Balance between assets and research projects and cassava users’ requirements. Developing research projects and outreach initiatives involving all the country’s areas. Developing a sub-regional framework for concerted action and for research asset transfer between researchers and the players in the cassava industry. Balancing human, animal and industrial utilization levels in order to raise production level in Africa.